In the admittedly narrow world of Cheetos-fast food mashups, Burger King’s Mac-And-Cheetos and Taco Bell’s Cheetos Quesadillas have some new competition. 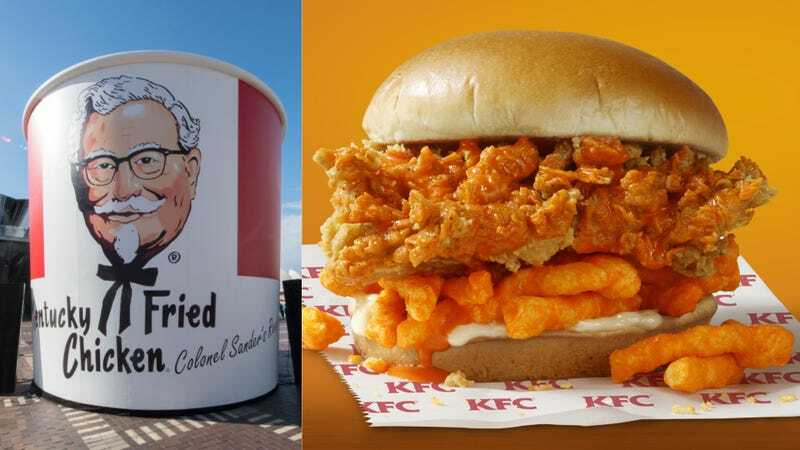 KFC announced it is testing a new Cheetos Sandwich in selected restaurants at locations in North Carolina, Virginia, and Georgia. KFC lovingly describes in a press release: “Made by coating a juicy, hand-breaded Extra Crispy chicken filet with special Cheetos sauce and placing it on a toasted bun with mayo and a layer of crunchy Cheetos, the Cheetos Sandwich will give you a blast of craveable Cheetos in every bite.” In this manner, KFC doubles up on the Cheetos-ness, providing a Cheetos sauce (the mind reels) as well as actual Cheetos in the sandwich. Someone on the Takeout staff was immediately psyched. Cheetos aside, we’re always in favor of added crunchiness in sandwiches. Potato chips between bread is a childhood classic, fried onion bits are always welcomed, and even pork rinds sound like a decent idea (we love carnitas on a tortilla with pieces of chicharrones crumbled atop). It’s that textural contrast of squishy sandwich with accents of crunch that’s satisfying to bite into. So to have crunchy cheese-dusted sticks with battered fried chicken, tempered with the richness of cheese sauce and mayo? This all sounds gratuitously delicious. The KFC Cheetos Sandwich market testing kicked off yesterday and will only be available for the proverbial limited time, so get in there, Southerners—let us know if you do try it. What the finger-lickin’ heck is KFC Gaming?